Well, as I promised, I upload h film self-edited with Ankou Producer today. Today you’ll see our wilder side in the video..
We’re still struggling to find the meaning….. Anyway, please enjoy watching this! いったい team H の partyとはどんなだろう….というのが気になる方々のために事前におしえます.. 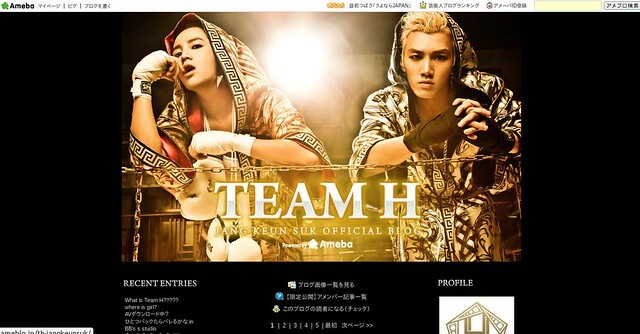 TEAM H Ameblo just opened!!! I hope TEAM H spirits will spread to the world!!!! NOTICE 1: Even if you’ve already been registered, if you are “非公開” member, it doesn’t mean you are included in the number of reader. Unfortunately the default setting is selected as “非公開” member. To check your membership status, please see the instruction below. NOTICE 2: I also post a technique to leave comments in non-Japanese below. NOTICE 3: I recommend you to be アメンバー of no-one, too. 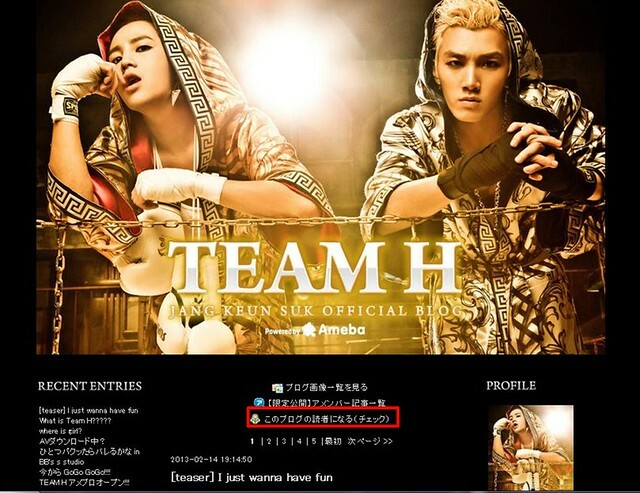 As you know, Jang Keun Suk opened Team H/ JKS official Ameba blog (a.k.a. Ameblo). You can access the blog without any registrations, but if you register as the reader, the number of his blog readers increases. One of the purposes he opened the official blog on Ameblo was he thought it must be useful to draw attention from those who haven’t known them before. So please help to promote the blog with the registration as a Ameblo membership. The instruction is as follows. (1) Access his official Ameba blog and click “このブログの読者になる（チェック）”. If you’ve already been registered as Ameblo member, please skip to (6). As he announced beforehand, today, on Feb. 14th at 12:00, Team H/ Jang Keun Suk official blog opened on Ameba blog (a.k.a. ameblo), Japanese popular blog service. He opened this blog to promote Team H spirits to the world. And he expects that this platform is good to let people who don’t know Jang Keun Suk or Team H well realize who they are. Especially he expects to get more men’s fans! To show them, he’ll try to post one never-seen-before video each day. By doing so, even who can’t attend Team H party nearly held in Japan will understand them. You can access the blog without registration. Big Brother already has his ameba blog, but he hasn’t updated for a while… -_-; Anyway, please access the blog often and promote it to the world! Zikzin!! There is unusual air of tension. 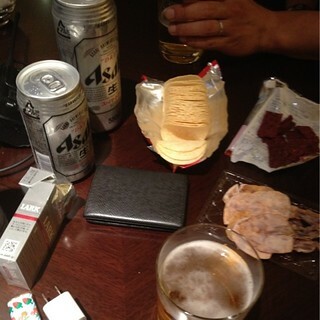 tenshi_akuma’s note: This blog is Mr. Makimura (Makimura-san), a bodyguard during JKS stay in Japan. I think they’re good friends personally.